"They roamed the skies in their sharp-nosed P40's, dispelling the notion that Japanese pilots were invincible." While not arousing as much popular interest as the European campaigns, throughout World War II, the challenge that spread across the Pacific and into Alaska remains key to winning the war for the Allies. From the jungles of Guadalcanal to the battle of Attu on the Alaskan coast, the Pacific campaign hopped from island to island and often the loss of control of one single island could spell disaster for American forces. 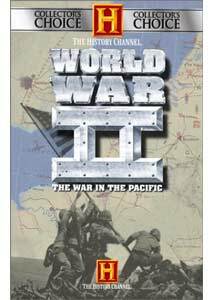 World War II: The War in The Pacific, a two-disc DVD set from the History Channel, brings these battles into focus. Featuring several documentaries detailing several isolated battles, this disc offers amazing combat footage, imparting a stunning sense of just what price we paid for freedom. Much attention is paid to the U.S. Army and Navy in each segment and the strategies involved. From the storming of various beachheads to close hand-to-hand combat, WWII: The War In The Pacific is, at times unflinching. The authentic footage of a combat cameraman during the invasion gives the viewer an eerily disturbing up-close view. The leaders in the Pacific, General Douglas MacArthur and Admiral William "Bull" Halsey are shown in detailed form—Halsey in particular, as he receives the focus of the disc's closing documentary. While informative, Halsey's piece looks more at his career and life rather than any one isolated event. It is possibly the best documentary included. What is less impressive is the showcasing of only the American side of the conflict. At times, it seems as though the Army and Marines are fighting a faceless enemy, as the Japanese are only referenced from time to time. Overall, this is a fine set that will undoubtedly be played more than once in my DVD player. At some point it would be nice to see an entire collection of both the Pacific and European campaigns, but until then, this offering more than fits the bill. Image Transfer Review: Using film stock taken from true combat camera operators, the source is flawed and grainy, yet as it is historic footage, this is understandable. What is not acceptable is the graininess of the scenes with the hosts of each of the documentaries: as they walk through a room adorned with World War II memorabilia, the screen is filled with blurred images, bleeding colors, poor detail and sharpness. Audio Transfer Review: The largest problem with the sound is an audible hiss and an even more frustrating lack of depth in the center channel that makes the track, at times, difficult to hear. Presented in a Dolby Stereo, this is a disappointing mix. Extras Review: No extras are offered. There are six chapter stops for each documentary. At a retail cost of only fifteen dollars, it is hard to pass up this set, especially if you are a history buff.